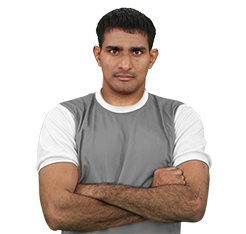 Surender Nada is an Indian Kabaddi athlete. He plays for Patna Pirates in the Pro Kabaddi league and is one of the best defenders featuring in tournament. He defends the left corner and is most feared for his ankle hold. He was bought for ₹10 lakh by UP Yoddha in the PKL 2019 auction. Surender hails from the state of Haryana which has produced a large number of successful kabaddi athletes. Surender was coached by E Baskaran and Ranbir Singh Khokhar. He is a national level player and has been a part of many victorious international campaigns. Surender was the highest scoring defender in the opening season of Pro Kabaddi League. He was one of the major contributor in U Mumba's victorious season two campaign. Nada has been a part of the 2016 Indian team which won the Men’s Kabaddi World Cup. Surender began his PKL career with U Mumba. After completing three seasons at the U Mumba camp he was bought by Bengaluru Bulls. Nada currently plays for Haryana Steelers. In this move the defender holds the ankle of an escaping defender with extreme power. This move creates an excellent opportunity for a tackle. Surender was a part of the world cup winning Indian team in 2016. He was also a part of India's victorious Asian Kabaddi Championship team which was held in 2017. Nada played an important role in India's victory in 2018 Dubai Kabaddi Masters. In the Pro Kabaddi League, Surender has 19 High 5s in 70 matches and is in a tie for the maximum number of High 5s. He also has a record for five consecutive High 5s in five consecutive matches in season 5. He is the second most successful defender in Pro Kabaddi League.